I’m thrilled to find someone willing to think outside the box when dealing with the entrenched dogma that has crept into the field of theoretical physics for a century now. While I applaud your efforts and agree whole heartedly that the current crop of popular theories are for the most part the spurious musings of people incapable of seeing the bigger picture, I have to say that your Squish Theory fails to address the underlying fundamental questions necessary for a truly complete understanding of how existence is even possible. For instance, your theory depends largely on particle charge state behavior without first explaining what particles are made of, or how they can exist at all, in any state. The bottom line here is you have to start with a clear understanding of how energy can remain in the tight little bundles that we call particles instead of instantly dissipating into the lower energy space that surrounds them. A particle is fundamentally nothing more than a self contained energy imbalance. That said, there is only one way that I know of that a concentration of energy can generate a containing sphere around itself that is STRONGER than the energy it’s containing. The answer can be found in an interesting property of wave form interactions. 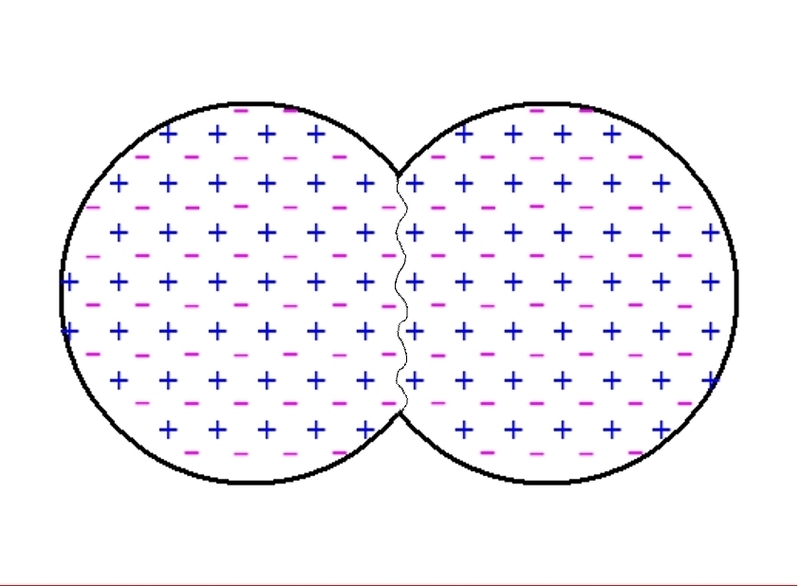 When two waves pass each other, two additional secondary waves are created. One is a difference signal with a power equal to the difference between the two original signals. The other is a sum signal with a power equal to both of the original signals combined! These secondary summed waves are the only way to explain HOW highly concentrated energy imbalances CAN exist continually in the particle form without instantly dissipating into a state of equilibrium. Once you realize that our entire physical existence is the result of these fundamental energy imbalances and their natural tendency to continuously progress toward the lower energy state of equilibrium, it becomes easy to understand why every thing in the universe takes the form that it does and why it acts the way that it does. Even the arrow of time is easy to understand when you realize that literally every part of our existence is on that same path toward equalization. The bottom line is, once you figure out the fundamental underlying process that makes physical existence possible, all the other problems and questions in the physical sciences pretty much answer themselves. 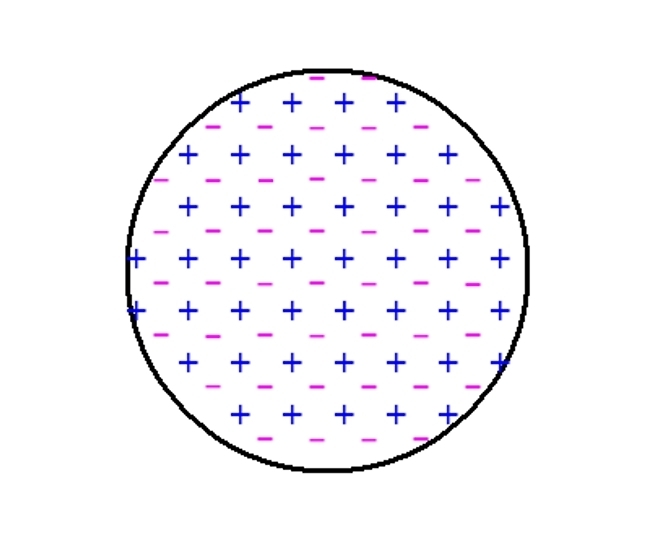 Even though the particle charge state behavior in your Squish Theory doesn’t ultimately explain how particles of energy can exist in the first place, a clear understanding of the underlying processes at work, does help to reveal how these particles can have states of ‘charge’ in the first place and how EM properties interact the way they do. So keep up the good work. We need more people like you who are willing to question the flawed thinking and political dogma that has made such a mess of the physical sciences lately. My complete theory explains the universe in terms of a single constituent, but on this page I have concentrated on the logical consequence that particles can only be collections of positive and negative charges. 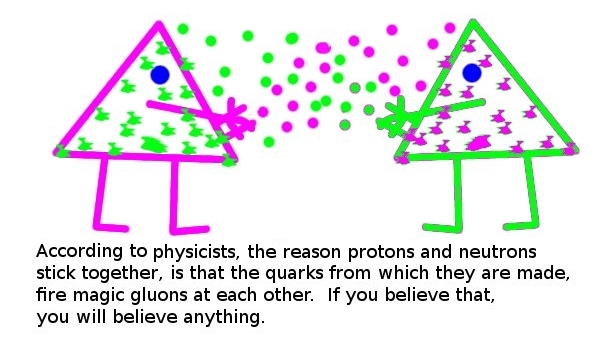 This is a simple testable idea, but it does not interest physicists as they want to believe in imaginary beings like quarks. What physics really needs, is professional physicists who are prepared to challenge the nonsense in physics, but it seems that if they do so, then they get excommunicated. Humans have always believed in nonsense, and probably always will, and I doubt there is anything I can do about it. But thanks for your comment. I can’t comment on your theory, but I can tell you that the internal structure of protons is an experimental fact. Proton Proton Scattering at high energy shows evidence for point-like scattering within each proton akin to the evidence for nuclear structure within an atom revealed by Rutherfords ‘gold foil’ experiments. Rutherford’s experiments were clear cut, and of course protons and neutrons were later isolated to confirm the theory. But when quarks were sought they could not found; instead of accepting this as evidence they did not exist, it was instead claimed that they could not exist other than inside particles. I am aware of the Breidenbach scattering experiments but not the details. 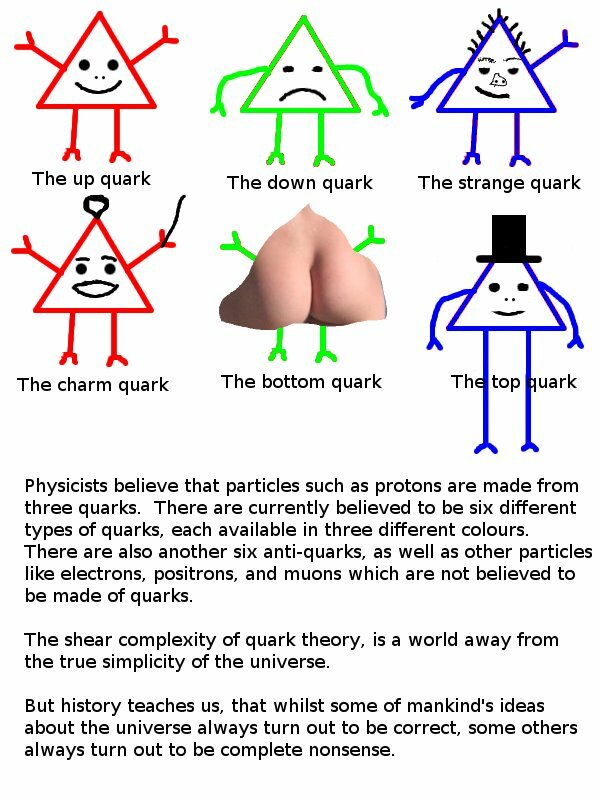 I have found plenty of webpages describing the types of quarks, and assuring the reader that they exist and that they have been proved by experiment, but none that explains the experiment adequately. Even relativity pages describe the MMX, so there is reason to assume that the Breidenbach experiments are not exactly clear cut. “The experimenter first fired electrons at high speed towards a proton. The electrons bounced off the proton as if off a spherical ball, as indeed they should do in squish theory. This part of the experiment was known as elastic scattering, because the electrons rebounded at virtually the same speed that they hit the proton. Then the experimenter cranked up the power, until the electrons were travelling at nearly lightspeed, and had so much energy attached to them that they had a mass thousands of times that of a stationary electron. This time on colliding with the proton, most of the energy of the collision was turned into new particles, so the electron rebounded with slightly less speed and much less energy than it originally had. This scattering is termed inelastic. If you know somebody with the expertise to create some kind of graphic to illustrate the Breidenbach experiment, it would be a valuable asset to both supporters and opponents of quark theory. I cannot use Squish theory to make scattering predictions, but I tested it as best I could on my “research paper” page. The question I have always asked is where is the equal and opposite force of gravity. If you take gravity as an inwards towards centre force and add a spin you get spheres as seen in stars. If you assume opposite gravity is outwards from centre and add a spin you get string just like spinning fibre into thread. If matter affected this way broke during formation and some mass was lost/ignored by the universe then an imbalance occured and that is why we only see inwards gravity. The equal and opposite force refers to two objects falling together under gravity, so the earth accelerates towards the moon at 1/81 the speed that the moon accelerates towards the earth. For a planet as a whole, the inward force of gravity is balanced by the repulsion between electrons on the edge of atoms. The earth is not quite spherical because it is spinning, the same is true of the sun. I am not talking about today. I am talking about an imagined start. What we see today is unbalanced inwards g only. Where is the balance of g, why only inwards. An imagined 1st time inwards g appeared on one piece of matter, equal & opposite force would have been outwards g on another piece of matter. If outward g broke each piece & some matter was lost to or ignored by universe we would see the unbalanced inwards g only that we do see today. EM is balanced, we only see em when charges are unbalanced. The photon is said to be massless but is particle of em energy. E=kg.m^2/s^2, if kg=0 then E=0. If E is measured but no mass, then there is a mass type we can’t measure because to have E there must be kg. Only some unbalace in the types of mass would give the unbalanced g we see today.